Girls/boys grab your Mom, Dad, Grandma, Granddad or family friend and prepare yourself for an evening of fun, dancing, contest, prizes and refreshments. The DJ will play your requests and the crowd will get into the excitement. 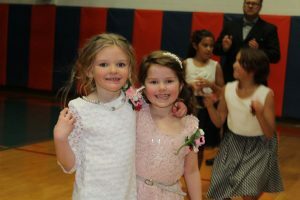 Each young lady will receive a corsage and commemorate photo. Space is limited so register early and save money. Those who pay at the door cannot be guaranteed a corsage.